I’d never heard of Wynard until I bought a small acreage nearby on Tasmania’s North West Coast. Wynard (population 4,800) could never be mistaken for a hip and happening place and its streets and green rolling hills certainly exude the tranquil melancholia common to small, isolated hamlets. Yet, there’s more to this quirky place than meets the eye. In the early years of white settlement, Tasmania’s North West Coast was a popular destination for missionaries and religious zealots. With a fervour unseen since, they built churches and schools and attempted to convert the local indigenous population. Just about every denomination exists in Wynard including Jehovah’s Witnesses, Anglican, United, Catholic and Presbytarian — although with the population overwhelmingly Anglo-Saxon, there is little chance a synagogue or mosque will open any time soon. The Exclusive Brethren also have a school here and female students are occasionally spotted in the local supermarket with long skirts covering their ankles and walking meekly behind the males. Like many farming communities, the annual show is an opportunity for locals to display their cooking produce — including cakes, biscuits and scones — and their agricultural prowess with giant pumpkins, prize birds and all things woolly, beefy and four-legged. There is also the ‘Bloomin’ Tulip Festival held annually over a September weekend. The festival itself is part of a larger promotional campaign called The Colours of Wynard which celebrates the beautiful coastal spring flowers. The tulip farm on nearby Table Cape is a popular tourist destination and a tulip festival is held in Gutteridge Gardens on the banks of the Inglis River. Prior to the festival, tulips are planted in flower beds along the streets of Wynard, leaving no doubt as to the event’s purpose. Over the weekend, a variety of stalls offer local produce such as wines, cheeses and honey while others sell hats, scarves and jewellery. Bands, often led by high school students, keep everyone entertained between general announcements and activities. During the summer and autumn there are water sports on the Inglis River and visitors can learn to sail for $5 a lesson. (I doubt you would find another sailing club that offers lessons any cheaper.) Manouvering and tacking on the river is actually quite simple and children are frequently captaining their own small boats. Tranquil walking trails wind alongside the river and the track to Fossil Bluff is a popular destination for those interested in dinosaur prints preserved for millions of years. And then there’s the Wynard market. Every second Sunday Australia’s worst market opens for business. The locals cling to the idea that one man’s trash is another man’s treasure and so there’s an awful lot of junk for sale. It’s worth a trip, however, just to gawp at the outrageous prices stallholders expect for items that should have been taken to the tip long ago. A dis-used train track runs the length of the coast. If the State Government funded a light rail it would be one of the world’s most scenic rail journeys. Yet the will and money is lacking and there is now talk that it will become a bike track. This would be a fantastic use of the rail line but, like many things on the North West Coast, the talk is rarely accompanied by action. There is a small airport at Wynard and Rex Airlines flies in three times a day. Rex is an excellent regional airline whose planes each seat about 30 people. I like flying Rex, but be prepared for a bumpy ride as small aircraft offer little protection from turbulence. In summer, the coast gets more lively as people travel from Hobart to their holiday houses at Boat Harbour and Sisters Beach, stopping in Wynard to grocery shop on the way. After six years here, I’ve noticed this influx of people makes the whole place seem almost cosmopolitan. So if you’re planning a trip to the North West Coast, it’s worth spending a day or two in Wynard. At the very least, you can tell your friends about the small town with the really, really bad market. If Stanley didn’t exist then you would have to invent it. This quirky town (population 428) sits on the North West Coast of Tasmania. It derives its name from former British Prime Minister Lord Stanley and was originally claimed by the Van Diemen’s Land Company and settled in 1826. Situated in Circular Head, Stanley has a thriving scallop industry and is the North West Coast’s main fishing port. You can see evidence of the local industry at the wharf where a makeshift conveyor belt, comprised of a garden hose, plastic water tubs and various tubes, processes the scallop shells and loads them into trucks. These shells are then distributed to local farms for fertiliser while the scallops are destined for dinner tables. But these days may soon be over as fishermen are being hit by the dual evils of red tape and mining. Gas exploration companies detonate charges off-shore and the shockwaves kill millions of scallops. In addition, Hobart bureaucrats insist that fishermen stop at midnight — usually mid-haul — to complete paperwork. Besides the fishing industry, Stanley relies on tourism. Many travellers venture to see the Nut, an extinct volcano that dominates the skyline. The Nut can be accessed either by a track with a steep incline or a chairlift and its summit provides a panoramic view of the coastline. 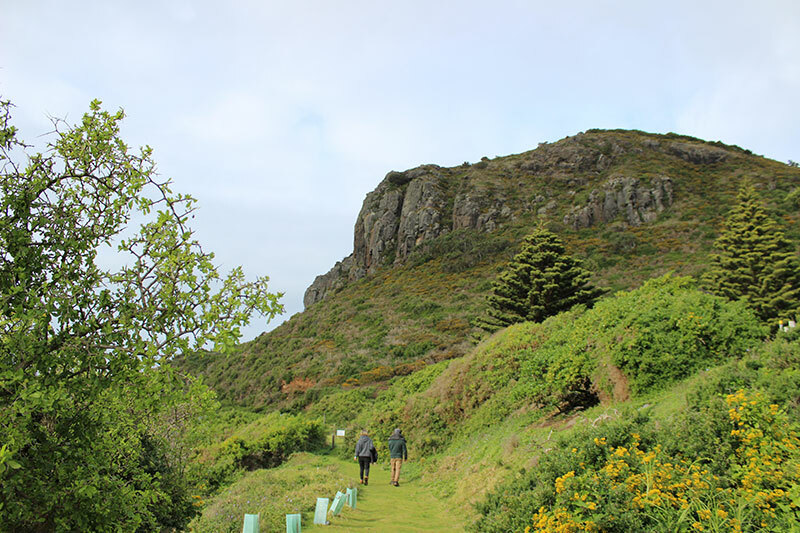 There are walking trails on the volcano which take the visitor through a wealth of flora and fauna. At the bottom of the Nut penguins come to lay eggs. On this particular day I saw two chicks inside their burrow waiting for their parents to bring home dinner. A possum was chewing grass nearby. Normally a nocturnal animal, it had no fear of our approach and continued to nibble as we stopped and took photos. In the bay, dolphins were leaping out of the water as they herded fish towards the shore. A lone puffer fish, which looked more dead than alive, was swimming slowly around the rocks by the wharf. Seal tours run throughout most of the year but are closed for winter. The seals no doubt seeking warmer climes to escape the chilly, windy winter that plagues this coastline. Whales pass through Stanley during the spring, en-route from the Antarctic breeding grounds and many birds nest here over the year. Visitors can watch the frolicking sea life from the many cafes and fine-dining restaurants that overlook the sea. Many artists have settled in and around Stanley and the art galleries feature paintings, sculptures, clothing and jewelry made from local material. There is also Provedore 24 which, with its mixture of clothes, shoes, accessories and luxury food items, is a truly marvelous find in a small town. Stanley is one town away from world’s end. Not far from here is Arthur River, a town that greets visitors with a plaque that informs them they have reached ‘the edge of the world’. Tourism provides a steady income for Stanley and tourists take pictures of the sign proclaiming it to be the tidiest town in Australia. Joseph Lyons, a former Prime Minister, grew up here in one of the many neat cottages with barely a blade of grass out of place. Yet, Stanley’s perfection could be the inspiration for a horror story. Who knows what darker secrets lurk behind its serenity? The Nut, once a raging volcano but now a backdrop for less violent forces, is like a metaphor for life. There is peace to be found at Stanley. It is a place at the end of the world but certainly not forgotten.